A look at goings on in November 2013. Another year-old photo, overgrown Homeacres. A year later – Steph and I were removing a polythene mulch, under which…. 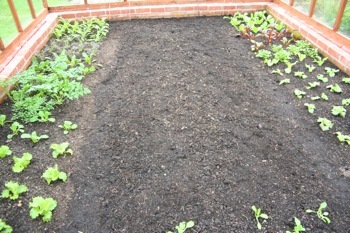 The bed is clean, ready for some ornamental plantings. 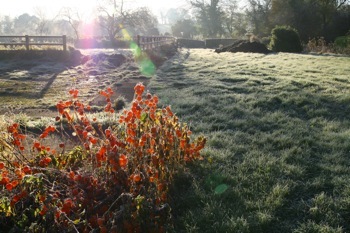 After a wonderful, open autumn, we now have winter coming. I am about to stir and spread biodynamic preparation 500, to improve the soil’s energies in ways I can imagine but do not understand. I like the bd outlook, although prefer to do my own thing as well, rather than following what feels like strict formulae. I am the same with some of the organic rules, for example “four year rotation”: mine is more variable, for example just two years between tomatoes in the polytunnel. 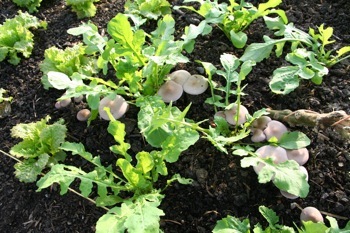 In undug soil I often see soil fungi, such as these among salad rocket. 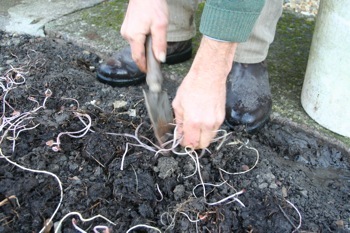 They help plant roots to find moisture and butrients, such as for the celeriac Prinz. Frost-hardy and able to stand outside for harvests through winter are kale, savoy cabbage, leeks (except long-stemmed summer varieties, so harvest any remaining ones quickly such as Zermatt in the photo), lambs lettuce, many other winter salads to varying degrees, parsnip and swede. 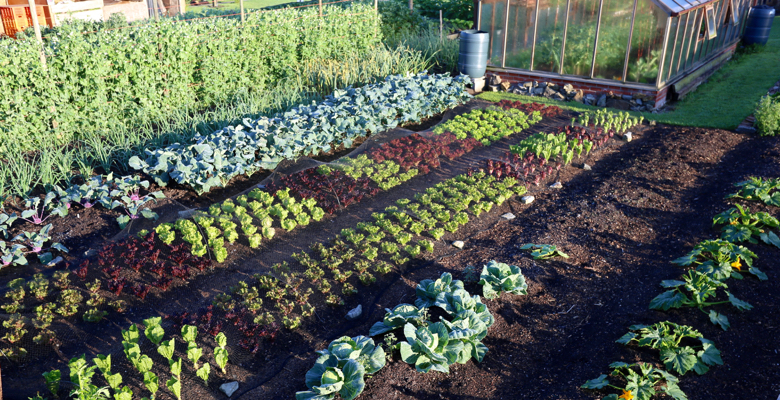 Other roots such as beetroot, celeriac and turnip are tolerant of some frost but below-5C or so they risk damage, and so are best harvested now, leaving some soil on their roots and putting in a box or bag where they can be kept cool, even slightly frozen. 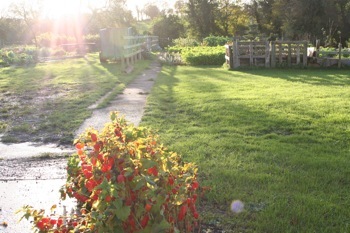 November sun on part of Homeacres garden. 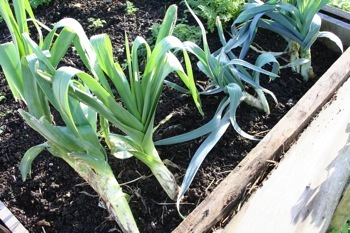 Zermatt autumn leeks (long stem, pale leaves and now harvested) and Bandit for winter on the right, to pick as late as April. Second growth of Kuri squash, now in the conservatory. Tomatillo plant which is now frosted. 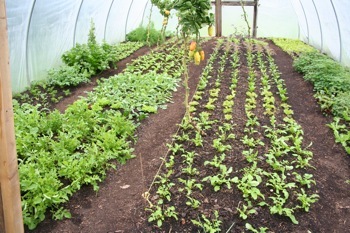 Covering salads with cloche or fleece is worthwhile. 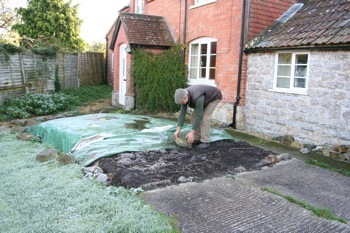 Fleece can be simply laid on top because it tends to be damaged by wind if supported by hoops. 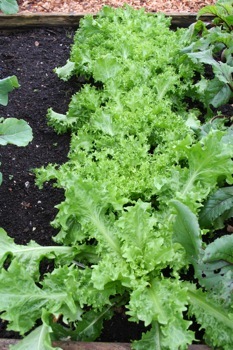 Winter salads are not killed by low temperatures and survive moderate freezing, rather it is wind and precipitation damage to their leaves which hurts plants more. 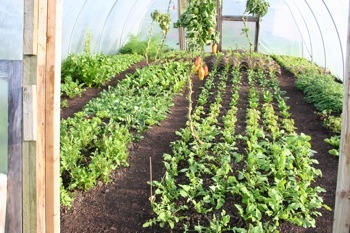 Hence the worth of a cloche or polytunnel, where plants freeze quite solid sometimes, then recover. 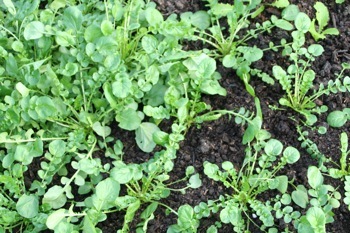 Cress, before and after picking. 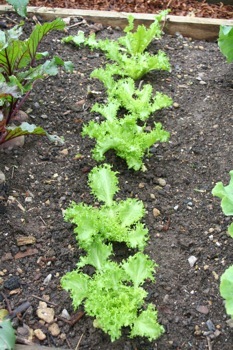 With salads undercover, it is best to water minimally when the weather is cold. Plants are mostly dormant and need almost no water, and survive better with dry leaves, so that fungal spores such as leaf-mildew cannot multiply. 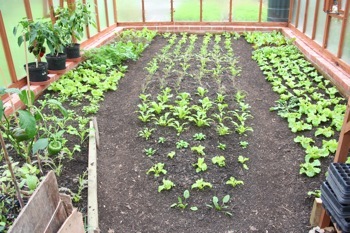 For example my tunnel and greenhouse soils are now fully moist and I shall not water salad plants for at least a fortnight, maybe longer if the cold continues. 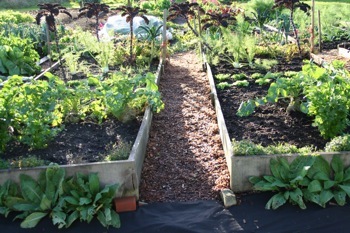 Another benefit of watering less is a dry soil surface with less slugs moving around and eating leaves. 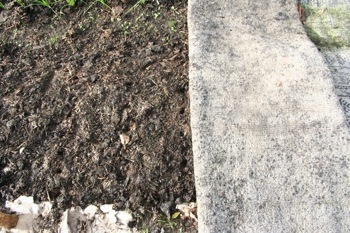 Before and after, carpet mulch on bed of cow manure. 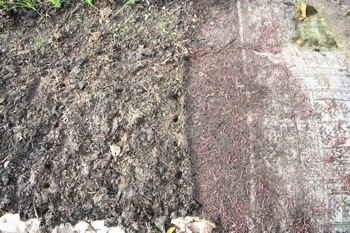 A few minutes after pulling it back one sees a mass of brandling worms eating both manure and carpet, they are voracious! Many of my experiments are coming to the end of their harvesting period and I look forward to sharing some results here over the next two months. 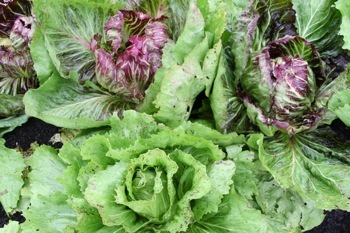 Results so far are fascinating and there are new experiments for next year too – I just received a ton of SEER rockdust from Binn Soil Nutrients and am setting up some trials, for example of lettuce in bags and boxes, with and without rockdust. This rockdust is finer than I used before and Steph has been seeing good growth from it at her work garden, on some beds where plant health was previously average: I think rockdust has most value for poor soil, but must surely improve mineral content and health of plants and I want a way of measuring that. 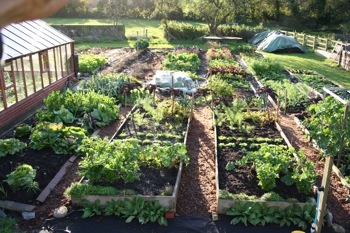 1 Bed filled 11 months ago with topsoil on top of grass, showing endives (planted late September) before…. …and after a recent picking . 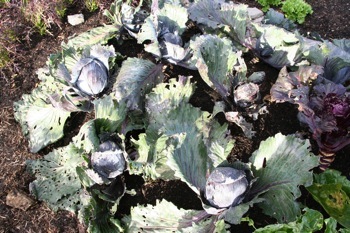 Harvests on 1st and 14th November gave 340g soil & 730g compost; whereas the soil bed gave heavier cabbage and garlic. Full summary to come in December probably. All in a year… the chicken run last November when I arrived here. 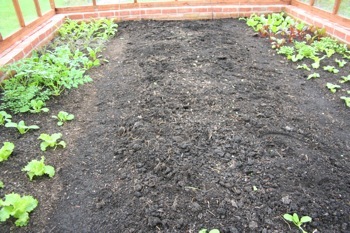 This autumn, left hand bed is garlic planted after climbing beans, with old manure in the barrow to go on top. Gardeners sometimes talk about this time as the start of a new year, and I feel precisely that while clearing beds and spreading compost on top, the main stage of preparing ground for spring sowing and planting. Recently for example, I picked the last Czar runner beans, which have grown well and still had a few green pods on, with lovely fresh beans inside, absolutely delicious after just ten or fifteen minutes in boiling water – they taste sweet. 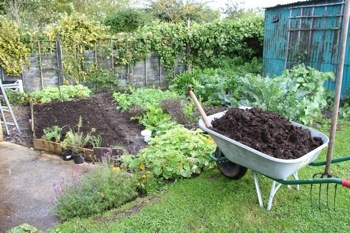 After clearing the bean plants to compost, I pushed garlic cloves into the soft surface and spread an inch and a half of cow manure on top, which is enough to keep feeding the soil while it grows both the garlic and then kale or chicories next autumn. It was a pleasure to do this while remembering how weedy this patch of ground was a year ago. 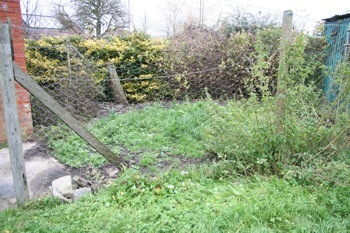 The weedy pasture was covered in carpet since May (6 months). 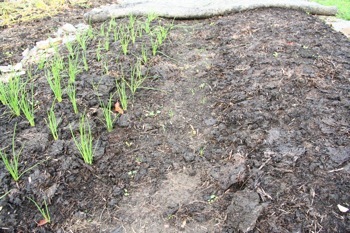 Manure spread on the narrow beds, and most weeds are now germinating in the uncovered path, which I shall mulch with a thin layer of less rotted compost. I also planted garlic in a new bed where I have been mulching the pasture since May, with an old carpet which is now half eaten by brandling worms! 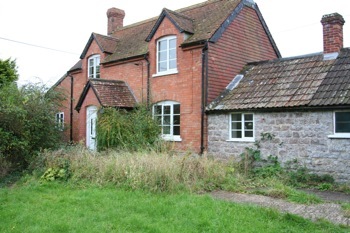 The carpet is nine feet wide (2.8m): in July I spread old manure on two beds of 3.5 feet with a narrow 15 inch pathway between, and kept the carpet on until September, when I rolled back one end during filming to plant some spring onions, see http://youtu.be/HATC3rG6NbQ. Another month later and It is like night and day, how many weeds are growing in the pathway between two beds of manure, compared with the mostly weed-free beds. People often say that manure brings weeds but I mostly find the opposite, that on undisturbed soil it covers existing weeds and grows less weeds than in nearby, uncovered soil. 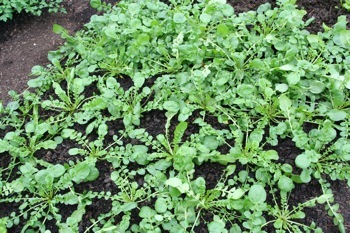 Any weed seedlings are easy to pull out of compost and manure, especially after it has weathered a bit on the surface. The trick is to pull/hoe/disturb them as soon as seen, when small or tiny even, much easier than dealing with large weeds. 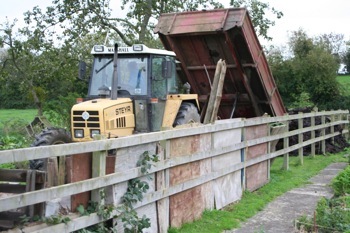 So recently I was happy to see George delivering some more manure! George delivering five tons of cow manure. 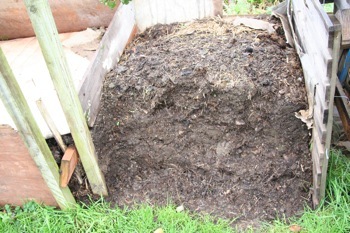 My own compost, about a ton in this heap, good quality but…. Two weeks ago we planted these Green-in-the-Snow mustards into soil recently covered with this homemade compost and you can see all the weeds germinating happily! 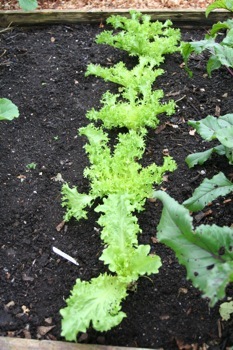 Normally I would not spread seedy compost just before planting but this time there was a small area of the tunnel which had missed out in spring and I was topping it up, wanted to see the effect on growth of this compost which has been performing well in a trial of lettuce plants (see December’s post). By comparison there are almost no weeds germinating elsewhere in the tunnel, for example among the landcress (picked in front, unpicked at back). 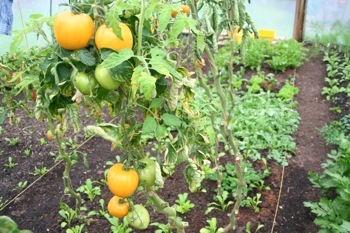 In the greenhouse, after pulling tomato plants I simply walked on the dry, compost-covered soil to even it out and break up surface lumps; no tools needed! 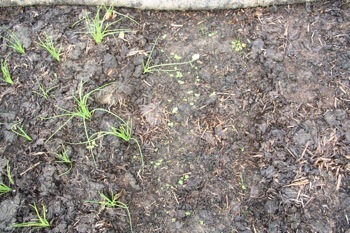 Regarding weed seeds in compost, an exception to the above is any home-made compost which had flowering/seeding plants and a fair amount of soil as ingredients, because soil usually contains innumerable weed seeds. I am finding this with Homeacres first batch of compost, made last winter and which contained a lot of soil on weed roots, and the weeds such as nettles and grasses had been dropping lots of seeds into this soil. I think it is mainly my first heap which is full of these weed seeds because the later heaps had my normal ingredients of occasional weeds, grass mowings, straw, cardboard and vegetable wastes. 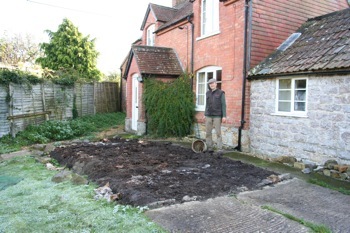 This autumn I shall be spreading about four tons of Homeacres compost, its quantity having been increased by additions of fresh horse manure from Jenny my neighbour. 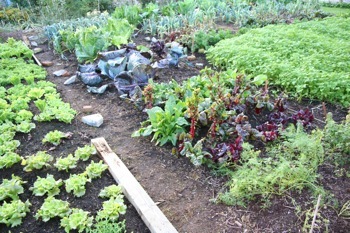 I add it whenever there is a lot of green matter to add, such as grass mowings and tomato haulm. Partly I do this to add some brown to the green (the straw and some wood shavings) and partly as an activator (the horse poo). Heaps have all got pretty warm but from now on, with less green matter going in, the temperature declines and winter compost is a slow, more fungal process which makes equally good compost, just taking longer than in summer. See the thread “Spent coffee grounds” on the forum which has compostpope’s good information about composting in winter: this thread has become an epic with over 40,000 views in ten months! It is great that the forum is so popular and thanks to all of you who share their experiences of no dig, compost, weeds, varieties etc. 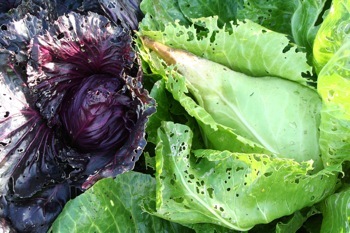 I removed mesh from the cabbages on October 20th and found some lovely hearts of Kalibos (red) and Filderkraut which needs eating as its tip is rotting a bit, partly from rubbing on the mesh I suspect. 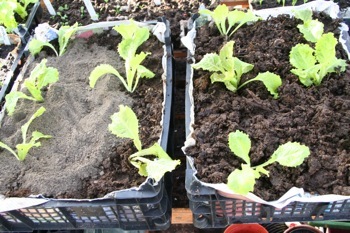 Leaf lettuce Maravilla on left and mustard on right, in the Shumei experiment (more on that in December). This Filderkraut chose to lie down and looks healthy for it. The leeks werealso protected (from leek moth) by the same mesh, and on right are cabbage Huzaro F1, really solid heart, staying out for now. Because it has been such a warm October, it has felt too early to harvest for winter: roots and hearts do not store well until the temperature drops regularly below 10C or so. 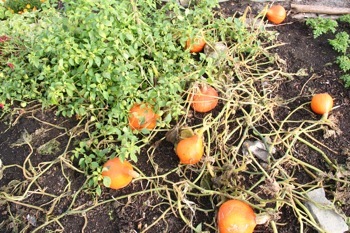 From October 18th to 28th, the average temperature here was 12C by night and 17C by day, similar to early summer, hence the abundant growth of autumn salads. 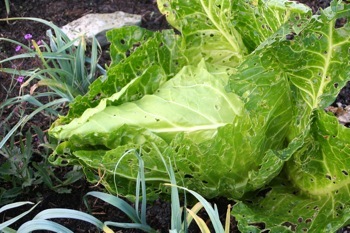 Even now there is no proper frost in the weather outlook so I am leaving cabbage hearts and beetroot outside for now, but have pulled carrots and put them in a sack, because of slugs and root fly. 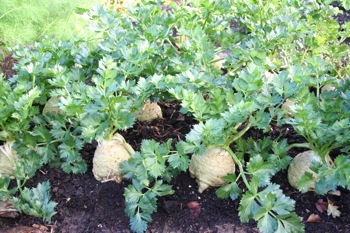 Celeriac are still growing and can stay out until it turns really cold, below -5C or so. 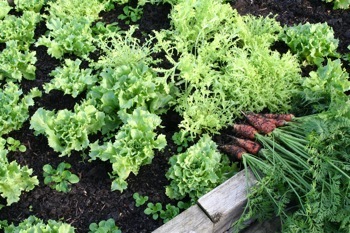 Kale comes into its own now and gives regular pickings, probably until December at this rate, chard also is still growing well – see salads below. 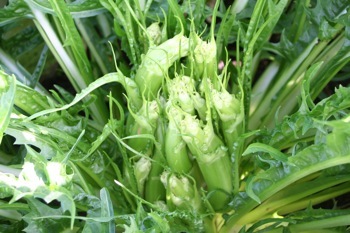 A new harvest for me is Puntarelle chicory which has grown large clumps of ‘dandelion’ leaves, followed by clusters of hollow spears which are sometimes called “asparagus chicory”. 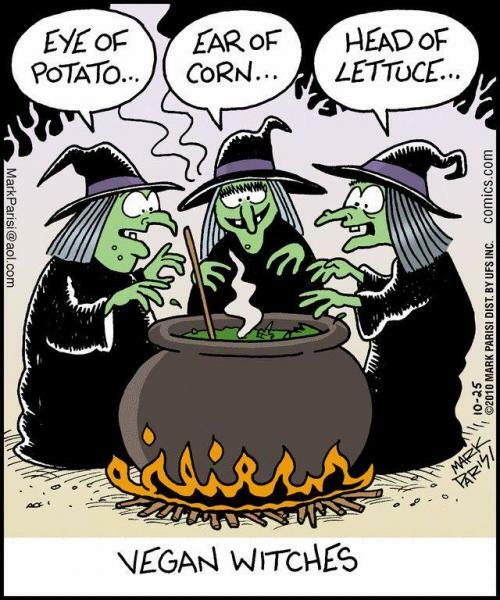 I like to eat them raw, or you can steam them, or make funny shapes by cutting lengthways and leaving in cold water so they curl up. Normal chicory hearts are Lusia in front and my favourite Marzatica behind – I find its hearts stand well and are less eaten by slugs. Also I harvested three sweet potato plants and was amazed that the feeble-looking one in a pot by the shed’s south side, variety Beauregard, had two decent sized tubers, 330g altogether. 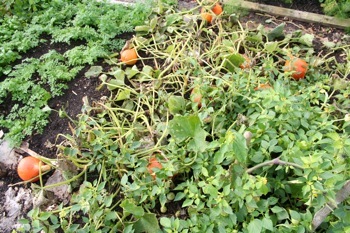 Then the greenhouse plant, variety T65, which had trailed healthily in all directions, had no tubers at all!! However my sanity was restored by the tunnel plant of Carolina Ruby* which yielded 2.6kg, and I have put these roots in a carrier bag in the conservatory so they continue to sweeten – apparently the flavour is poor if you eat them when just harvested. Similarly, we were given some fresh-picked Butternut squash and I was curious to compare its flavour with the others I have grown. Result – mild flavour and almost no sweetness at all, confirming that Butternut does need storing in some warmth, around 25C if possible for a fortnight or so, to bring out the sweetness. Whereas Uchiki Kuri, Buttercup and Crown Prince are all delicious now and I was especially impressed by Steph’s soup for a course with Crown Prince in, so thick and creamy. * Carolina Ruby was my only sweet potato variety to offer pretty flowers every day from July to October, similar to and smaller than morning glory. Sweet potatoes are Ipomea batatas, common morning glory is Ipomea purpurea and both are in the Convolvulaceae family along with bindweeds. 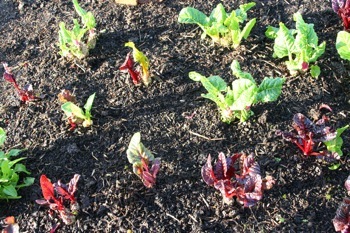 Hence their rapid growth when given enough warmth. Photos on October 21st of Yellow Brandy wine. 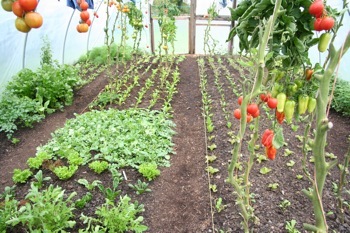 Tomatoes ripening, with salads planted below and around them. 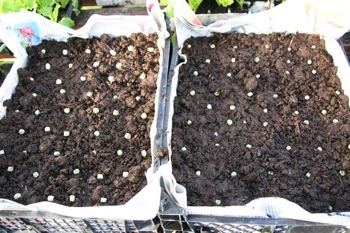 There are only a few sowings you can make now which will give leaves before February, undercover, unless the high temperatures continue… Mizuna, leaf radish, mustards and salad rocket grow fast to are worth a try, if you do not already have plants. 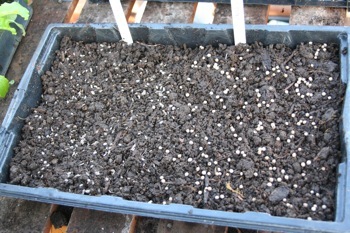 Peas for shoots also, and seeds of any leafy vegetable or herb in a tray to put on a windowsill, for cutting as microleaves after about three weeks. 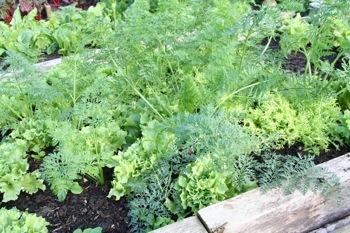 Dill + coriander, all in greenhouse. 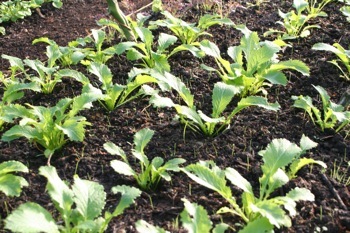 Sown into homemade compost with cow manure, no other additions. 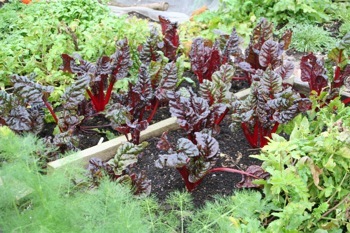 Also you can pot on the large main root of chard plants, and large beetroots too, to keep on a windowsill and provide small salad leaves through winter: not a lot of leaves but great colours. 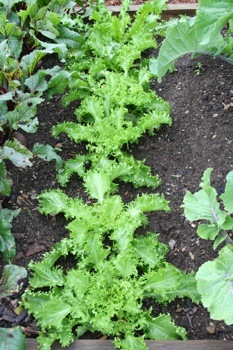 Salad on October 31st, in greenhouse and tunnel, about one third lettuce Grenoble Red, one third mustards, one third other. I am already picking from plants which went in more than two weeks ago and the mild weather means that many of these plants will be cropping through November, until it turns properly cold.